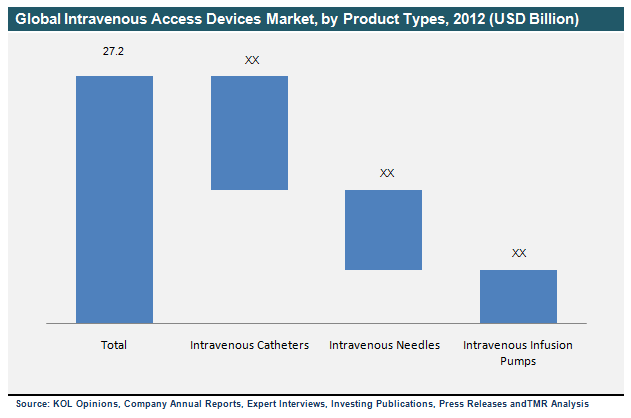 A new research report published by Transparency Market Research titled ‘Intravenous Access Devices Market - Global Industry Analysis, Size, Share, Growth, Trends and Forecast, 2013 - 2019’ discusses the global intravenous access devices market in terms of USD million. The report shows the market size and forecast for the period 2011 to 2019, considering 2012 as the base year. According to the study in this report, the global intravenous access devices market was valued at US$27.2 billion in 2012. Further expected to grow at a CAGR of 7.8% during the forecast period of 2013 to 2019, the overall market is expected to reach a market value of US$46.5 billion by 2019. The report provides information for each product segment and sub-segment within the intravenous access devices market, along with the market overview, drivers, restraints and various opportunities in the market. The compounded annual growth rate (CAGR) for each segment in this market has also been provided in the report for the forecast period 2013 to 2019. Some of the key drivers fueling the market growth are widening patient base and growing geriatric population that has eventually made North America the biggest and most accessible regional market for intravenous access devices in the world. In the year 2012, North America generated maximum market revenue in this market, in turn significantly increasing the demand for intravenous access devices for medical diagnosis and treatment services. Also, the growing number of enhanced diagnostic and therapeutic medical procedures and the widespread occurrence of diseases among populations of different ages have together fueled the demand and growth for intravenous access devices in the global market. Intravenous (IV) access devices are extensively implemented to administer drugs of different classes such as analgesics, antibiotics and antipyretics. Besides, the major three types of intravenous access devices found in the market include needles, infusion pumps, and catheters. These devices postulate the need to administer medication or anesthetic during different surgeries, hence, further supporting the growth and demand for this market. Some additional factors propelling growth into the global intravenous access devices market include development of vaccines, growth in geriatric population, increasing number of accidents due to old age, price competitiveness in medicines and related products, and rising popularity of home healthcare. Many regions are witnessing a major shifting trend towards home healthcare facilities which has further boosted growth and use of catheters and infusion pumps in different medical sectors for various purposes. Such factors are widely supporting the overall growth of the global intravenous access devices market. In the recent years, the prevalence of diseases such as cancer and tuberculosis combined with disorders related with old age has also increased. Analyzing and identifying a variety of growth factors governing the global growth of the intravenous access devices market has become significant for any business that reckons to form an identity for itself in this wide industry. Geographically, after North America, Asia-Pacific is expected to grow rapidly from 2013 to 2019 and will show the highest growth rate of 9.4% over the forecast period. Growth in this region is attributed due to rise in target diseases, geriatric population, improving home healthcare facilities and other general healthcare infrastructure, and rise in healthcare expenditure. The rise in disposable income will increase the purchasing power of people for medical services such as surgeries. Owing to such reasons, the intravenous access devices market in Asia-Pacific will rise in the near future. Some of the major vendors and manufacturers of intravenous access devices market profiled in the report include Baxter International, Becton, Dickinson & Company, CareFusion Corporation, Teleflex Incorporated, Smiths Medical, Covidien Plc, Medtronic, Inc., Fresenius Medical Care AG & Co. KGaA, B. Braun Melsungen AG, and Hospira, Inc.